In addition to snapshots of friends and family, holidays and special events, many of us also take pictures… just because we liked the way something looked, but often without knowing why our attention was attracted to a particular scene. For example, we might record children playing in a park, an old house, or a bicycle lying in the grass – but we don’t know those children, or the people who lived in that house, and that’s not our bicycle. 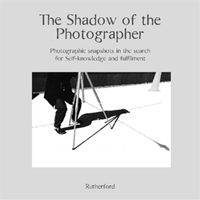 Written for the reader interested in photography, intuition, consciousness, self-expression and personal development, The Shadow of the Photographer explains how what we photograph and the way we photograph it can provide us with valuable insight into the way we see ourselves and offer us the means to self-awareness and acceptance. When we are moved to record a scene or a moment with which we have no conscious connection, it may be that, in the arrangement of elements within the scene, we have intuitively recognised a personally relevant metaphor: an allegorical description of a ‘mental picture’ that lies below the horizon of our conscious awareness – and to which our unconscious is now trying to bring to our attention. In this book, it is my intention to provide anyone with access to even a simple camera with the means to open a dialogue with your creative unconscious: a trustworthy and compassionate companion on the journey to discover – and to become – who you really are. As citizens, we are exposed daily to thousands of images, each designed to solicit our emotional attachment to a product, a corporation or a political idea. Through the selection and juxtaposition of images, the visual media – the new ‘literature’ of popular culture –shapes the way we ‘see’ the world and the meaning we ‘find’ in what we are shown. This enormous influence over our perceptions gives the corporate or political sponsor the means to ‘frame’ the limits of debate over important social, cultural and economic issues and to ‘manufacture consent’ in support of their socio-economic ideology – including our attitudes towards the Product, the Politician and the Right Priorities. If we are unable to recognize – or to consider critically – the ‘points of view’ advanced by those who shape the modern mediascape, certain alternatives become literally ‘unthinkable’. An understanding of the influence of visual design – Visual Literacy – is therefore necessary for the ability to participate fully as citizens in modern society. 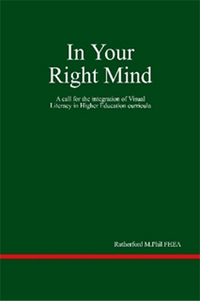 Although we have no control over many of the ‘mental pictures’ we have inherited, we must accept the responsibility for examining the pictures we carry around in our heads and consider their influence in shaping our beliefs and assumptions – because these will determine not only the lives we will lead, but the shape of the world we will leave behind.